This is a K.I.S.S. fly of the highest order. This fly was originally designed as a quick/dirty damsel nymph imitation and earned a permanent spot in my fly box in short order. 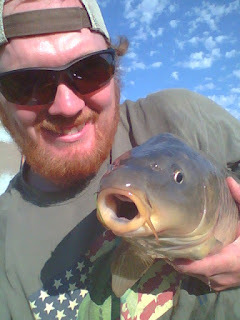 Carp in my home waters frequently cruise in & out of shallow vegetation while munching on damsel nymphs. 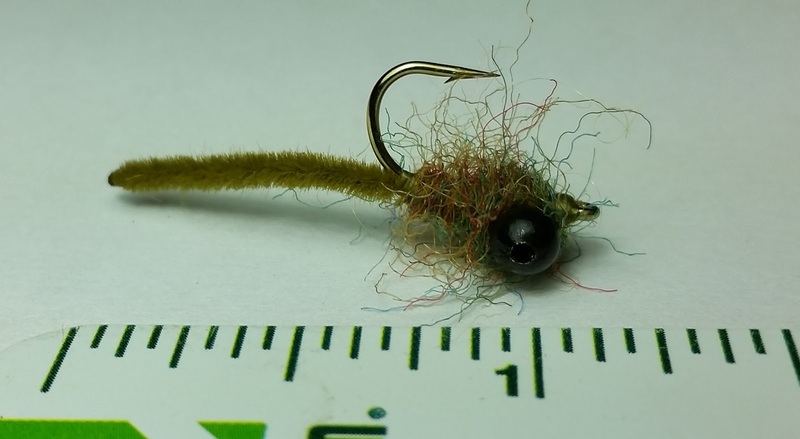 This fly rides hook-point up, has a slim profile in the water, and has just enough buggy leg action from the brushed out dubbing body. Simple tweaks to the pattern will bulk up the profile or vary the sink rate of the fly. 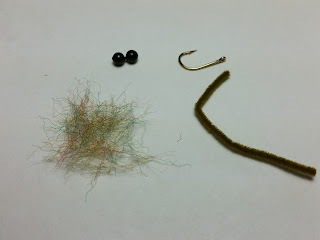 This is one of my top producing carp sight fishing patterns, but it catches everything that swims. 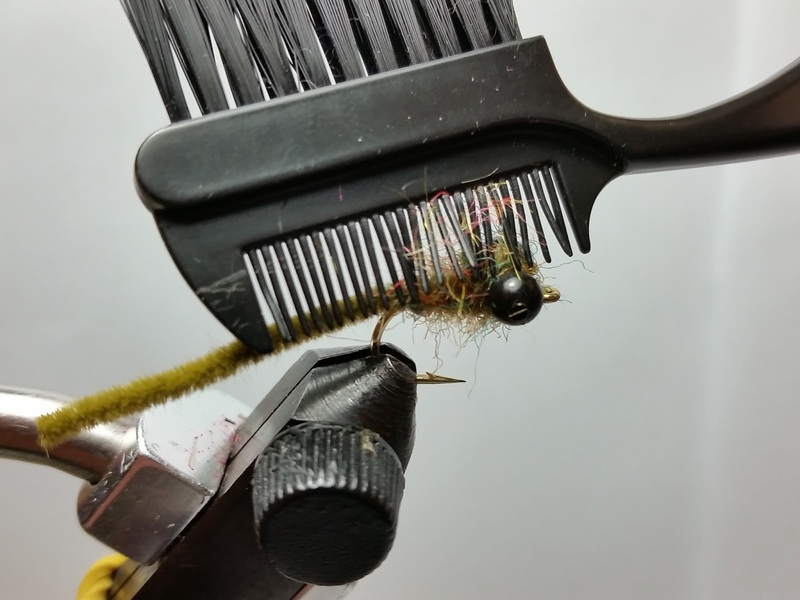 Slowly strip this fly along a weed edge of your favorite bass or sunfish pond. Or work it over the rip-rap of your favorite urban lake for some catfish or drum action! 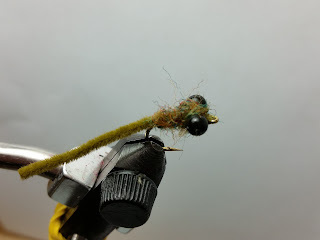 Body: Peacock Color Mr. Peacock Dubbing (Fly Tyers Dungeon). Or use your favorite "buggy"/"shaggy" dubbing here. I also recommend using a dubbing that's made with a mix of colors (nothing in nature is one solid color). 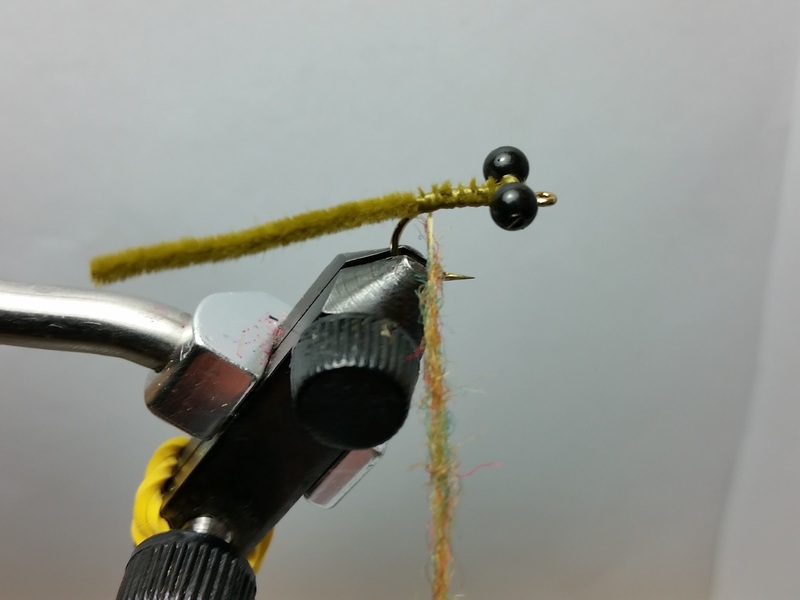 Apply a thread base and tie down a 1.5" section of ultra chenille. 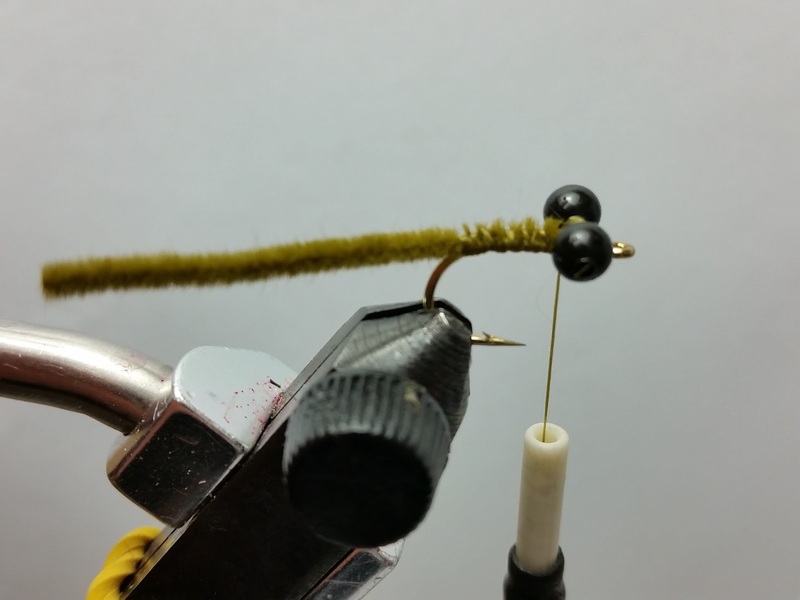 Start right behind the hook eye and lash it all the way to the bend of the hook. Be sure to keep the chenille on the top of the hook shank while tying it down. Tie down a pair of bead chain eyes right behind the hook eye on top of the chenille. This is important if you want to have the fly ride "hook-up" while still using lighter bead chain eyes. Bring your thread back to the hook bend. 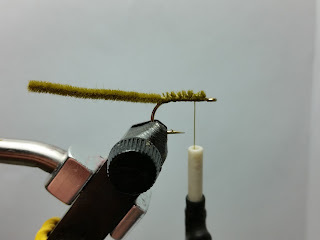 For a thinner "Damsel" profile, spin a healthy noodle of dubbing on the thread (touch dubbing technique). Feel free to use dubbing wax if you need. For a fatter "Dragonfly" nymph, use a dubbing loop or the split thread dubbing technique. Build a body with the dubbing noodle. "Figure-8" wrap between the eyes and finish the dubbing in front of the eyes. 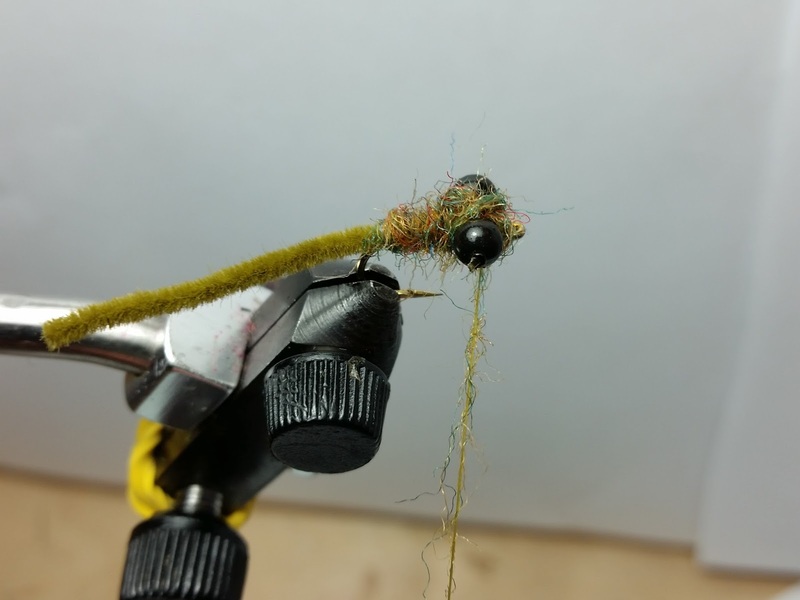 Build a small thread head and whip-finish the fly. Brush or pick out the dubbing. 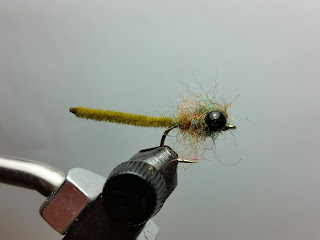 This fly seems to work best with the dubbing really brushed out and "buggy". The synthetic dubbing used here gives a great profile in the water. Trim the fly's tail so the overall fly is about 1" long. 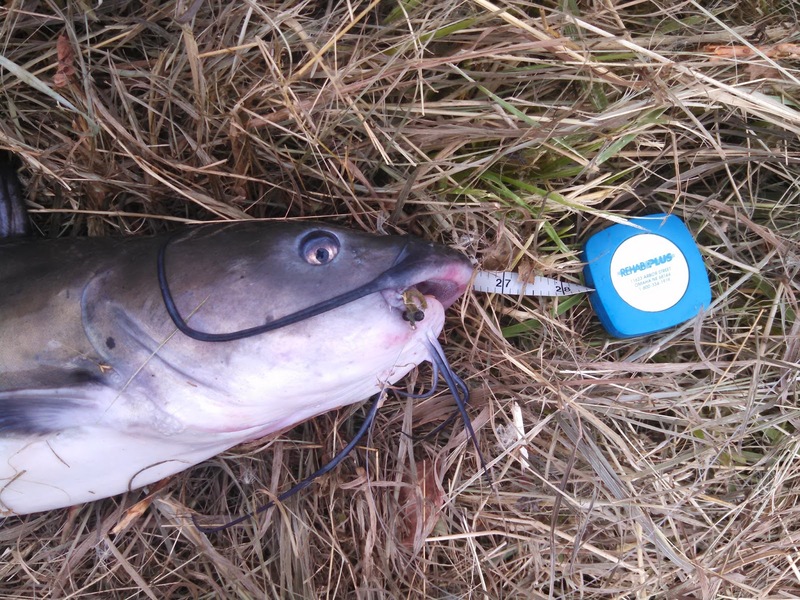 Channel Cats like Dostal's Damsel too! First used it yesterday; a small carp was refusing everything I had presented. Remember I had one of this in my bow .. second cast and fish was hooked. Awesome, I'm glad to hear this pattern scored for you!